The Playgoer: The Flagship of Theatre Booksellers about to Sink? The Flagship of Theatre Booksellers about to Sink? In case you were otherwise occupied at the end of August, you might have noticed Barnes and Noble's announcement that they were closing their huge Lincoln Center-area megastore. In January. How does this affect the theatre world? Well aside from the regular in-store events devoted to theatre-themed readings and performances, it also had the biggest stock of theatre books of any branch in the entire chain--anywhere. Not only that, but I once heard (by way of someone who heard it from someone in the publishing industry) that more theatre books were sold here at this one location than at any other store of any kind in the entire US. That's anecdotal, I know. But plausible when you think purely in terms of volume. Sure a specialty store like Drama Books will stock more and be more of a mecca to those in the know. But for "general readership," the random tourist or flaneur who wants to browse books...those were a lot of eyeballs on The Product, if you know what I mean. 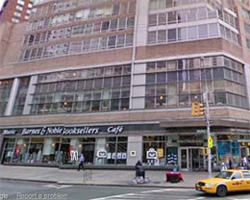 B&N says it will look for another (ahem, cheaper) Upper West Side location. But meanwhile, mark it as another blow to the already shaky field of theatrical publishing. Count on some BIG SALES!!! When they start marking down, go stock up. It already has a cheap Upper West Side location on 82nd and Broadway. I don't blame them for closing what must be a ridiculously expensive store. "[I]t also had the biggest stock of theatre books of any branch in the entire chain--anywhere." Funny, but I've always thought the Union Square branch had a much better theater section. If not bigger, then more interesting/relevant. I guess there's no chance that the theater book stores it chased out of the neighborhood will return. Welcome Century 21. Touchee, Mr. Lewis! Yes, how soon some forget how much Upper West Siders howled in protest at B&N knocking out our beloved independents. (Remember "You've Got Mail"?) But perhaps it says how even lower the culture has sunk when we mourn even the loss of a somewhat cultured megastore. And Ken, you're probably right that Union Sq (which is still there) was always a more interesting theatre collection. But I understand the sheer volume of the Lincoln Center branch sales was unbeatable--even if most of the sales WERE monologue collections and tributes to musicals. I wonder if B&N will transfer all those major in-store events to another branch (perhaps the Union Square location)? It'd be such a shame to lose those.